For the first time, students can truly see the concept expressed in Newton’s Second Law of Motion. They no longer have to accept the law as fact. In a matter of seconds, students can create a graph that shows the forces exerted during a collision are definitely equal and opposite. How Fast is a Dog Bark? Students can easily calculate the speed of sound to within 1% of the actual value. Such an experiment has never been so easy or so accurate. 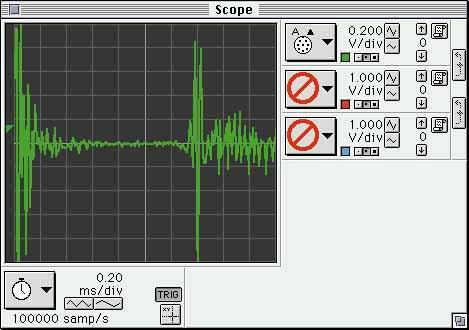 Use the oscilloscope to experiment with the sounds made by musical instruments, tuning forks, human voices or animal sounds. Clearly see the waveform differences corresponding to various sounds, beats, frequency changes and pitch.